I rarely finish an entire business book. Most leave me thoroughly overwhelmed or massively bored. However, “The Outward Mindset: Seeing Beyond Ourselves” by The Arbinger Institute changed all that. Not only does Arbinger’s latest work hit home for our growing Agency Ten22 team, it also supports Pragmatic Marketing’s core tenet: Nothing Important Happens In The Office (NIHITO). Let me explain. We often meet with healthcare technology and service companies fixated on inward mindsets. 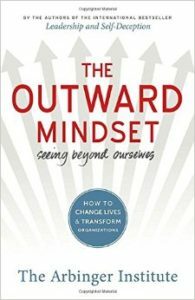 Defined by Arbinger, an inward mindset keeps companies, their employees and their leadership focused on “themselves and their own perceived needs and challenges, usually to the detriment of the team and the enterprise.” [i] In addition, an inward mindset creates disconnects between HIT vendors and healthcare provider organizations. Instead of knowing which technical capabilities or service offerings customers and prospects need, vendors get stuck hearing only what internal company executives believe. Or worse yet, vendors build their new products and services in reactive response to competitive banter instead of industry research and customer surveys. The result? Failed product launches, flat marketing campaigns and ignored media pitches. The solution for busy marketers is to understand and embrace an outward mindset. This blog post provides three practical ways to use the outward mindset for more effective HIT public relations. Outward mindsets are amazingly simple to implement on all levels: personal, professional and company-wide. A simple shift in thinking leads to amazing breakthroughs. The first step is to truthfully see the needs and objectives of others. These include your organization’s owners, managers, customers, partners, peers, workforce and direct reports. The lessons learned from Arbinger’s text can be applied equally across your entire organization. As I read the pages of this book, I kept reflecting on my own personal communication style. While I’ve always been attuned to the needs, wants and perspectives of others in my life, I usually fall short in the tactical execution of Arbinger’s principles. Here’s how. According to Arbinger, listening is a creative force. But true listening as defined by the outward mindset is much different than the listening pattern I use as a parent and manager. True listening requires focus and intent to learn. This book shed a critical light on my own bad habit of poor listening and habitual multitasking. From now on, I’m focusing first on the person and the conversation. I’ll ask my team to hold me accountable in the months ahead as I make this important outward pivot. You can apply the same principles from this book to healthcare industry media, editors and associations. Here’s how. Healthcare IT industry media professionals are people first and editors second. Just like all human beings, they want to be heard, understood and respected. Over the past decade we’ve worked hand in hand with all the leading healthcare IT editors and have learned three important outward mindset principles with regard to our industry’s media. Truth #1: Editors want to interview providers, not vendor executives. Talking with vendors, PR staff and consultants takes a backseat to interviewing actual healthcare providers for practically every healthcare IT editor. While some company CEOs and vendor executives take offense to this stance, it is important to engage your outward mindset here. Focus on what the editor needs instead of what your CEO demands by introducing them to actual provider sources with a solid success story to share. Vendor executives recruited from provider settings with strong recent provider experience are also welcome. Truth #2: Editors avoid young, ill-informed PR staff that waste their time. Perhaps the biggest complaint we hear from healthcare editors is that most PR staff don’t understand the healthcare industry, the publication’s readers or the association’s members. Healthcare is a complicated industry filled with jargon, acronyms and ever-changing regulation. It takes a seasoned professional to land solid, earned placements in healthcare IT. Using the outward mindset, only pitch healthcare media when and where it is appropriate. Research what each publication and association needs. Do your homework to review editorial calendars and only pitch stories and sources that are the right fit for your targeted list of healthcare editors. For example, Health Data Management doesn’t want to hear about your company’s latest pharmaceutical cure or medical device. Truth #3: Email is okay, but human interaction is better. Take a moment to think about how many unsolicited emails you receive every day. How often do you honestly respond to an email request that lacks prior personal connection? Editors are in the same bind. With thousands of healthcare IT companies and only several dozen top-tier healthcare IT publications, editors receive a multitude of emails every day. Without an established personal connection, your email pitches are a waste of digital time and rapidly become an editorial annoyance. Instead, build personal relationships by visiting editors in real life. If you don’t have the time or budget to do this, hire a recognized healthcare IT PR firm with long-standing editorial relationships to represent your company. Meet with editors on their own turf, not at busy industry conventions. By focusing on the personal relationship first, you gain a leg up on other vendors in your HIT niche and quickly rack up those highly coveted, earned media opportunities.